Here's a retro looking Royal Enfield that really is old. 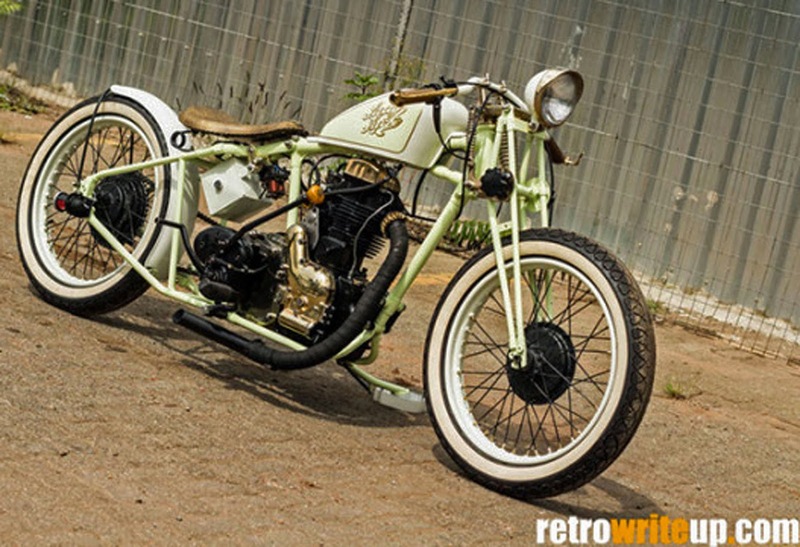 The Retro Write Up blog features a custom bobber made from a World War II Royal Enfield military motorcycle by OneOne Customs of South Africa. What do I like about it? For once, here is a retro-style bobber they didn't have to strain to make look old fashioned. It was already a rigid, with stark good looks. Dubbed "Lady Luck," this machine certainly meets the modern interpretation of the bobber look. An original bobber would have been achieved by trimming original parts instead of stretching to include new ones, and might have included some hard-earned nicks. This Royal Enfield custom appears beautifully finished, with brass plating used to brighten many bits. The frame is stretched 10 inches, requiring the chain to reach a long way to the rear sprocket. There's no chain guard, of course. The primary case is delicately cut away, so the primary chain, too, breathes fresh air. Watch your pants cuffs, please. The Harley-Davidson peanut tank used here sits high. But it does show off the always classic Royal Enfield motor. A box under the seat holds the battery. The War Department wouldn't have tilted it like that. The 1945 ex-Army Model WD/CO 350cc retains its original girder forks, according to Retro Write Up. Original 19-inch wheels and drum brakes are used. The machine takes a giant step into the past with a hand shift. The white-wall tires roll the calendar back even farther. Where's the bulb horn? There are more photos on the Retro Write Up blog.